This Vacation Rental Agreement (“Agreement”) is a binding contract between Wolf Creek Resort, L.L.C. (“Agent”) and each Tenant. The “Rental Fee” includes any and all costs, expenses, fees or penalties that Agent may charge the Tenants for their occupancy and use of the Rental Property as described under this Agreement including, without limitation, daily or nightly rental fees, check-out cleaning charges, mid-stay cleaning fee (if any), and early check-in or late check-out fees or penalties (if any). 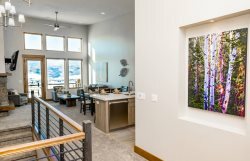 The Rental Fee may also include additional costs or fees charged by Agent for optional “Concierge Services” that may be requested by Tenants including, for example, ski passes, grocery shopping, delivery service, etc. Agent does not guarantee the availability of any such Concierge Services. Any portion of the Rental Fee that does not include Concierge Services is subject to Utah transient and sales taxes which currently total 11.1%. Any costs or fees related to Concierge Services are subject to Utah sales tax, which is currently 4.7%. Tax rates are subject to change without notice. Primary Tenant(s) must pay Agent a “Reservation Hold Payment” at the time the Rental Property is reserved. The Reservation Hold Payment is equal to fifty percent (50%) of the Rental Fee, and is fully refundable (minus a cancellation processing fee) until thirty (30) days prior to the scheduled arrival date. The remaining balance of the Rental Fee is due and payable NO LATER THAN thirty (30) days before the scheduled arrival date. If the Reservation Hold Payment was paid using a credit card, unless otherwise instructed in writing by the Primary Tenant whose name appears on such credit card, Agent will use that credit card to pay the balance of the Rental Fee. If, for any reason, Agent is unable to charge such credit card and/or the remaining balance of the Rental Fee is not received by Agent at least fourteen (21) days prior to the scheduled arrival date, Agent may cancel the reservation and the entire Reservation Hold Payment will be forfeited without any notice whatsoever to the Tenants. Any reservations made LESS THAN 30 days prior to the scheduled arrival date will require IMMEDIATE payment of the ENTIRE Rental Fee, and such amount will immediately become non-refundable. If the reservation is canceled LESS THAN thirty (30) days prior to the scheduled arrival date, all or any portion of the Rental Fee that has been paid as of the date of cancellation will be forfeited. The reservation will not be confirmed unless and until the entire Rental Fee has been paid. All payments must be made in U.S. dollars. Agent accepts the following credit cards: Visa, MasterCard, Discover, AMEX. Reservations may be canceled ONLY by contacting an Agent at [email protected] The reservation cancellation email must provide adequate information (i.e. reservation number, Rental Property address and arrival date, and/or name of Primary Tenant) so that Agent can identify the reservation and timely process the cancellation request. As stated under Section 1 of this Agreement, in order to receive a refund of all or any portion of the Rental Fee, the reservation must be canceled no later than thirty (30) days prior to the scheduled arrival date. Failure to comply with the cancellation procedures set forth in this Section 2 may result in loss of all or a portion of the Rental Fee. If you believe there is a chance of cancellation on your part, please consider purchasing third party “travel insurance”. NO REFUNDS OR CREDIT GIVEN IF CANCELING WITHIN 30 DAYS OF ARRIVAL. If Primary Tenant(s) are unable or unwilling to provide a Security Deposit Credit Card, then Agent may require a cash security deposit of $500 or more as solely determined by Agent. If the security deposit is paid by check, Agent must receive the check no later than thirty (30) days prior to the scheduled arrival date. Any cash security deposit will be returned in the form of Agent’s company check no later than forty-five (45) days following the Tenants’ departure date, provided there has been no theft or damage to the Rental Property, or any other violations of this Agreement. Primary Tenant(s) must be at least 25 years old. Agent may require proof of Primary Tenants’ age as demonstrated by a valid driver’s license, passport or other government-issued photo identification. If Agent discovers that the Primary Tenant(s) fail to meet this minimum age requirement, Agent may immediately evict all Tenants and the guests of any Tenant, and all payments made by any Primary Tenant will be immediately forfeited. Check-in begins at 4:00 PM. Agent will make every reasonable effort to ensure the Rental Property is clean and ready for occupancy by this time. However, in some instances, it may be necessary to delay occupancy until the Rental Property is ready. Please do not attempt to enter the Rental Property before check-in time, as doing so will delay the cleaning, servicing, and inspection of the Rental Property as well as your check-in time. Special arrangements may be made for early check-in, but must be authorized prior to stay by Agent 48hrs prior to arrival (charges apply). Check-out time is 11:00 AM. Upon check-out Tenants must follow the departure instructions posted at the Rental Property. Such instructions will include (i) disposal of all garbage, (ii) loading and starting the dishwasher, (iii) starting a washer-load of used towels, (iv) placing all furnishings and personal property items where they were upon check-in, and (v) locking all doors and windows. Failure to follow the departure instructions may result in charges to the Security Deposit Credit Card(s). LATE CHECK OUT: If any Tenant fails to vacate the Rental Property or remove their personal belongings by the check-out time, penalties may be charged to the Security Deposit Credit Card(s) and/or such penalties may be collected from any Tenants who fail to timely vacate the Rental Property. Such penalties may include, without limitation, additional daily or nightly rental fees and/or loss or revenue incurred by Agent due to the Rental Property not being available for the next group of tenants. Late check out may be arranged ahead of time and authorized only by Agent. If for any reason the Rental Property becomes unavailable (i.e. the Rental Property has been sold or is no longer in the Agent’s rental program, or is under maintenance or construction) Agent reserves the right to cancel the reservation or transfer the reservation to another property in Agent’s rental program. Should this occur, the reservation will be transferred to a comparable property, or Agent will refund (without penalty) any portion of the Rental Fee that may have already been paid. If a transfer should occur, Agent reserves the right to determine which rental properties are comparable. If Agent determines that comparable properties are not available, Tenants will have the option of selecting from available properties with a partial refund or completely canceling the reservation with a complete refund. If Rental Property is part of a condominium project or residential subdivision with “Common Areas” or “Common Facilities” (such as fitness center, swimming pool, hot tub, grills, etc.) Tenants and guests of any Tenant must comply with any and all rules or regulations regarding the use of such Common Areas or Common Facilities. HOUSE PARTIES IN OR AROUND THE RENTAL PROPERTY, OR IN ANY COMMON AREAS OR FACILITIES, ARE STRICTLY PROHIBITED AND ANY SUCH ACTIVITIES WILL BE GROUNDS FOR IMMEDIATE EVICTION! A basic supply of towels and bed linens will be provided at the beginning of Tenants’ stay. PETS ARE ABSOLUTELY PROHIBITED IN THE RENTAL PROPERTY. Any evidence of pets in the Rental Property may result in immediate eviction, forfeiture of all amounts paid, and additional cleaning fees being charged to the Security Deposit Credit Card(s). THE MINIMUM PENALTY FOR EACH UNAUTHORIZED PET IS $500. GLASS CONTAINERS AND FOOD ARE PROHIBITED IN AND AROUND THE HOT TUB AREA. TENANTS WILL BE CHARGED $70 FOR EACH ADDITIONAL REQUIRED HOT TUB CLEANING DURING TENANTS’ STAY. Christmas trees pose a fire hazard and cause excessive clean-up efforts. As a result, Christmas trees are strictly prohibited in the Rental Property. If any Christmas trees or similar items are used in the Rental Property, Tenants will be charged for excess cleaning expenses. The Rental Property is located in a quiet residential neighborhood. Quiet time is from 10:00 pm until 8:00 am, or as may otherwise be required by the rules of the homeowner or condominium association (if any). Tenants agree not to undertake any activities that interfere with their neighbors' right to quiet enjoyment of their property. This Agreement is only for use of the Rental Property beginning on the scheduled check-in date and ending on the scheduled check-out date. TENANTS HAVE NO RIGHT OF EXTENSION OR RENEWAL WHATSOEVER. IT IS EXPRESSLY UNDERSTOOD AND AGREED THAT THIS AGREEMENT REFLECTS A SHORT-TERM VACATION RENTAL AND IS NOT A LONG TERM TENANCY AGREEMENT. The rental transaction contemplated by this Agreement is neither a timeshare sale or plan of timeshare development, nor a vacation club. The venue for any lawsuit, dispute resolution or other legal proceeding related to this Agreement shall be Weber County, Utah.